I’ve got a bit bored re-doing the Mongol Command for my DBMM army. I’ve done three Cv(S) elements and one LH(S) element with two more half done. I then switched to re-doing the eight elements of Cv(S) and they are half done but I got a bit board with them too. There’s a trend here. I switched again, this time to Chinese Art(S) in Mongol service. I saw some of the excellent Donnington range of ancient artillery models on display quite a few months ago. I was really impressed by the painting style used on the display pieces and the fact that they had some that would fit nicely on a 40 by 40 mm base. I bought a few of ART06 and had a go. The results you see above manned by some Essex Chinese artillery crew (CHN 20). 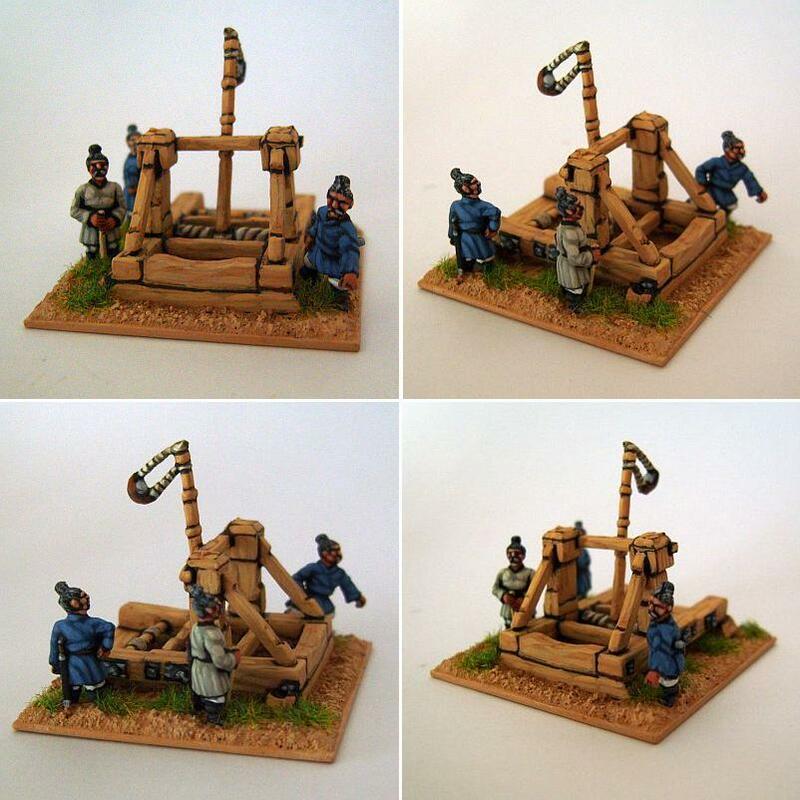 I know its an torsion mangonel and the Mongols are “famous” for human powered and large counterweight artillery but those models are enormous! Now I have some LH(S) Mongol generals to finish; some Cv(S) Mongol cavalry to finish; I’ve also primed the other mangonel and the two ballista I bought for Art(O) ; and I’m half way through all the Chinese artillery crew I bought. All this before I start on the Cv(O)! Sometimes I wonder. Hand pulled artillery conversion based on Donnington’s early perrier (ART42) courtesy of Swampster. He used the original crew, side frames and axle. The main beam is made up of a bundle of florist’s wire bound with thread and couple of cross beams were added. 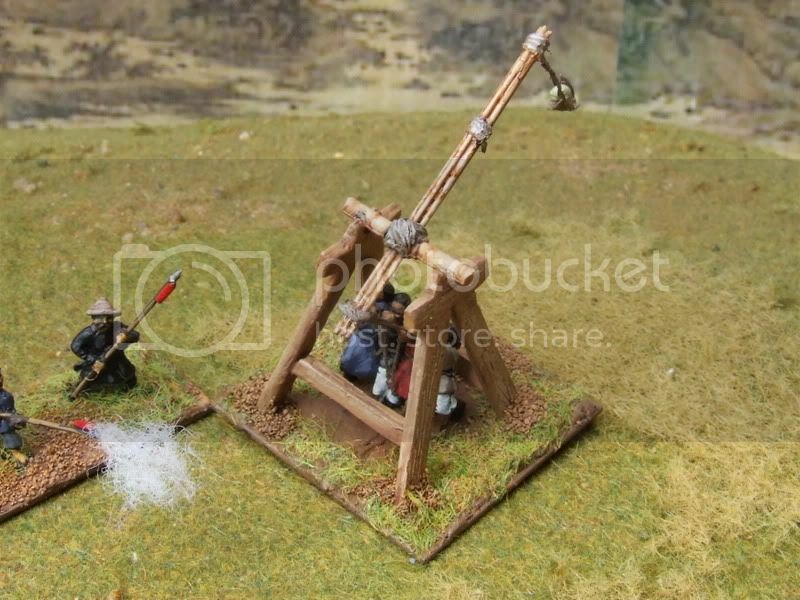 Glen Verburgt has scratch built both a counterweight trebuchet and a large perrier from plastic rod. Check out the second Mongol artillery piece. I like your clean/neat painting style Martin it is very well suited to 15mm. Thanks James. I wish I could paint quicker though. Oh yeah amen to that. Quality just takes time I guess.